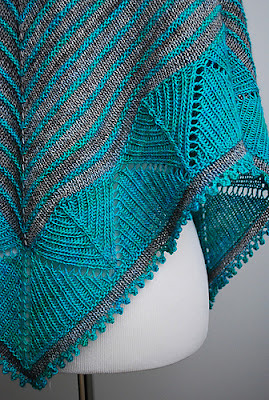 The knit and crochet along portion of the Indie Desgin GAL is running in the Indie Design GAL group on Ravelry* and continues to the end of the month. Today I'm bringing you an interview with fellow GAL designer, Kerri Blumer. Kerri Blumer works in the fashion industry by day and is an independent knitwear designer by night. 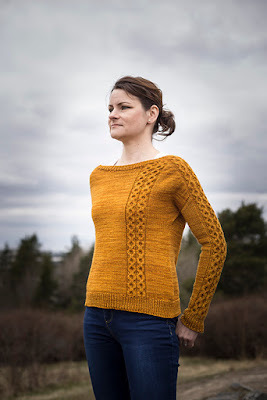 I first became aware of Kerri a few years ago when she offered to help me edit the photos for my Rudi sweater, and have been following her work ever since. Kerri primarily designs small, highly textured, accessories, which are perfect for gift-knitting, as well as a small selection of flattering garments. My grandma was a knitter, but I was too young to learn to knit when she passed. I still saw and appreciated her work - my mom still wears many pieces that my grandma knit for her, and it was several years after her passing that the last pair of slippers she had knit for us kids had finally worn through. I was always fascinated by her cable work, and I desperately wanted to learn how to make cables! I finally learned to knit about eight years ago during my freshman year of college. My mom knits a little bit, but hadn’t in a while so she put me in touch with a neighbor to teach me the knit stitch. I figured out most everything else via books or online tutorials and I haven’t stopped knitting (or cabling) since! I studied Fashion Design in college, so designing started rather organically for me. I started altering patterns I was working on to better suit me, and that evolved into making things from scratch. For my senior collection, I included hand-knit details on all of my pieces, and included one hand knit top. 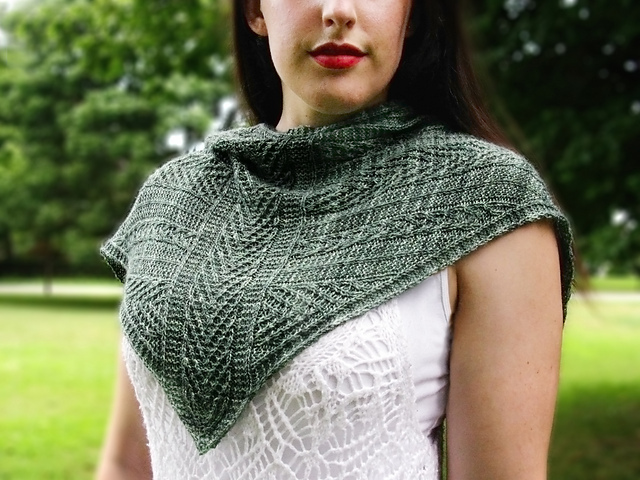 I have yet to write the pattern for that actually, but I have plans to do so one day! Pattern writing came pretty quickly after college; I’ve always been math-minded and I love the challenge of grading a design across a range of sizes. Now I work as a Technical Designer as my day job, where I am dealing with fit, garment construction, and grading on a day-to-day basis. It’s great being able to come home and work on the more creative side of things too – sketching ideas, working up swatches, choosing the perfect yarn for a design. I think the best part of designing and pattern writing is watching projects pop up on Ravelry & the knitters looking amazing in their FO’s! I’m hoping to get two more accessory patterns released before the end of the year – the patterns are mostly written, I just need to finish up the knitting and photograph my samples! For next year, I am looking to expand further into garment design. I am currently working on a new sweater to match my newest design, Aguacero Shawl, and I’d like to release that early next year. Lately I’ve been releasing about one sweater per year, and I’d love to be able to increase that to maybe one per quarter. I always have so many sweater ideas and I’d love to start bringing them out into the world. 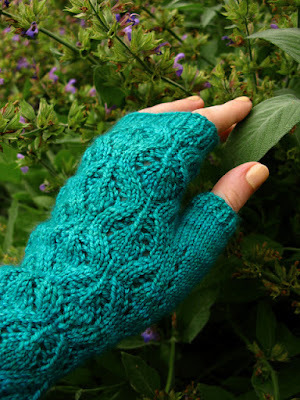 What’s your favourite knitting technique? What knitting techniques would you like to try in 2017? I don’t think I can pick a favorite! I always love learning new things in knitting. There’s always something new to try out! I’d love to learn more cast-on techniques in 2017. I have a couple of go-to cast ons that I use all the time, but I’d like to increase my repertoire – sometimes, you know the cast on isn’t quite right for what you’re making, but you’re not sure what the right one is! 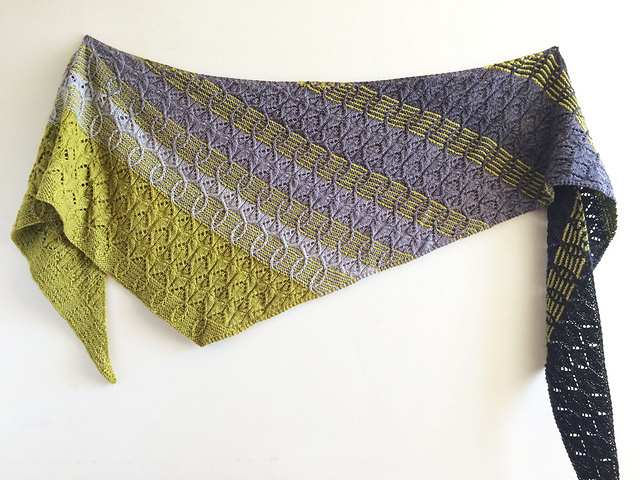 For shawls, check out Sarah Jordan of Knit/Wit and Amanda Scheuzger. Leventry by Sarah Jordan. Image copyright Sarah Jordan. Sagitta by Amanda Scheuzger. Image copyright Amanda Scheuzger. 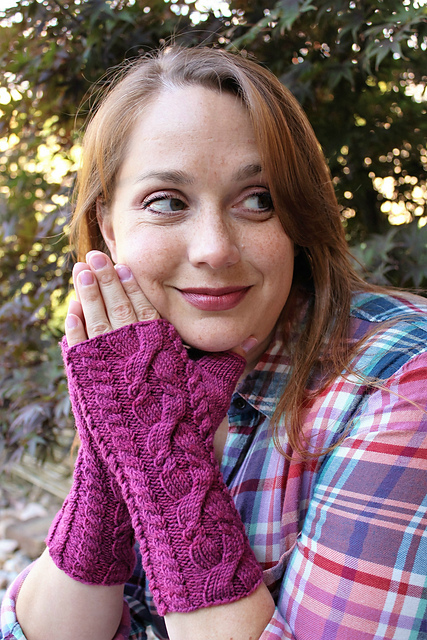 For fun & quick hats & mitts check out Beverly S. of Yarn Intercept and Katy H. Carroll of Katinka Designs. 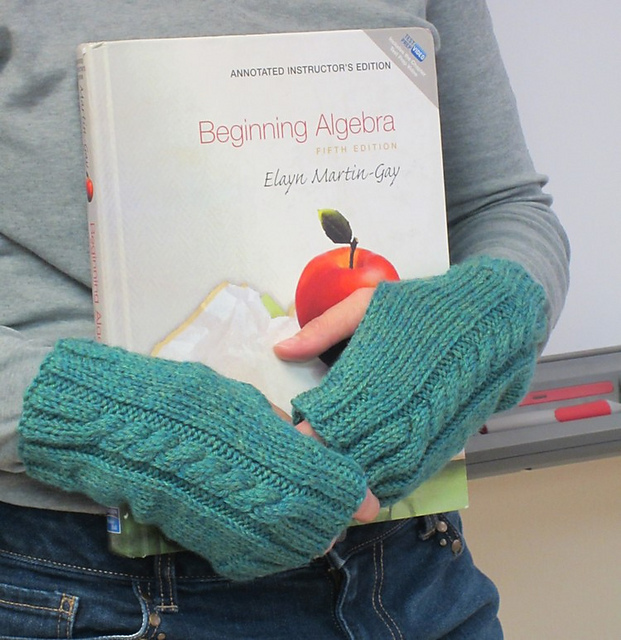 Middle School Mitts by Beverly S. Image copyright Beverly S.
Plummy Mitts by Katy H. Carroll. Image copyroght Katy H. Carroll. For great sweaters, check out Meiju K-P and Hanna Maciejewska of Hada Knits. Someday Sunday by Meiju K-P. Image copyright Meiju K-P.
Maisie by Hanna Maciejewska. Image copyright David Maciejewska. And a few more of my favorites are: Emma Welford, Kristen Jancuk of MediaPeruana Designs, and Hunter Hammersen. I do occasionally knit Christmas gifts for friends and family members. I don’t usually plan out gifts, but sometimes I’ll realize that my current project is just perfect for someone I know, and I’ll tuck it away until Christmas! I love knitting fingerless mitts, and I always knit more than I can reasonably wear myself, so those are always great gifts for loved ones who appreciate handmade items! About two years ago, my great aunt gave me and my mom the rest of my grandma’s stash after learning that I was an avid knitter. She knits here and there, but she thought that we might be able to use and enjoy it more. Among the many skeins, needles, magazines, and books, there was a pair of my grandma’s slippers – just needing a bit of darning at the heels and toes. I looked through the books to see if I could find a pattern, but came up short. So, I carefully looked at the construction and reverse engineered the design. Everyone got slippers for Christmas that year! Kerry can be found on Ravelry and Instagram as kerriknits, and blogs at kerriknits.tumblr.com.